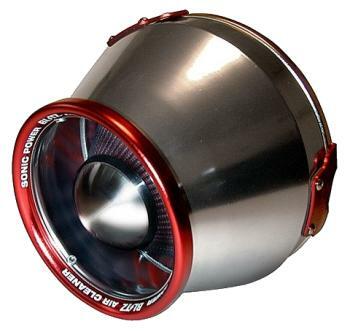 Blitz SUS Sonice Power Air Cleaner - Pann Auto Performance - San Diego largest aftermarket automotive performance parts - What do you drive? This is the latest design of filter to hit the market and is another ground breaker in terms of concept and stunning design. The filtration element is fixed inside a polished stainless steel heat shield which prevents hot air from the engine bay entering the intake and thus reducing inlet air temperature. Inside the shield sits the cone filter which has a very large base and narrow top giving in an ‘umbrella’ appearance, this clever design allows the maximum possible surface area of the filter element to be exposed to air being sucked into the intake. The height of the heat shield can also be adjusted up to allow more air to the filter element, and down to reduce air flow. Power gains are very good thanks to the ‘umbrella’ design of the filter element and filtration levels are amongst the best in it’s class. Sonic power makes a very distinctive high pitch whistling noise when the engine is revving hard, this sound can be varied slightly by adjusting the height of the heat shield. This is the top of the range of Blitz Filtration systems offering superior airflow, looks and sound.